Now that you know what’s on the list, let’s take a look at the people, science, and process behind PlantRight’s invasive plant list. PlantRight staff and Steering Committee at our annual in-person meeting. Since 2005, PlantRight has been collaborating with the nursery industry to voluntarily phase out invasive horticultural plants – in ways that make economic and environmental sense. The California Association of Nurseries and Garden Centers (CANGC) has played an active role in the evolution of PlantRight, which is a Sustainable Conservation-led initiative. Current CANGC Board Members sit on PlantRight’s committees and are represented among PlantRight’s earliest partner organizations. 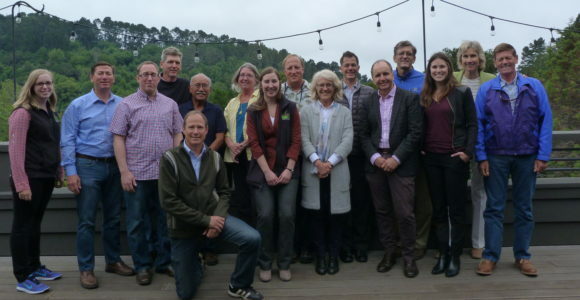 PlantRight’s Steering Committee convenes quarterly and includes a diverse group of approximately 20 industry stakeholders (all volunteers), including: growers, retailers, plant scientists, government agencies and more. In Fall 2012, PlantRight recruited several industry experts (also volunteers) to establish its Plant List Committee, to update its list. While the Steering Committee helps vet and approve the plant list, Plant List Committee members engage in the complex, involved and time-intensive process of selecting invasive plants and noninvasive alternatives. These individuals have each invested 20-hours (or more) of their time and energy, on the development of the annual plant list. During the 2014 process, PlantRight added three invasive plants to its list. One is an “emerging invasive,” Mexican feathergrass (Stipa / Nassella tenuissima), meaning that it is not yet widely established in California open spaces. Many invasives have a lag-time between when they are introduced and when they start to escape into the wild. The naturalization process often takes a matter of decades, but sometimes (as Australia witnessed with Mexican feathergrass) a matter of several years. This is the first time that PlantRight has listed an emerging invasive plant. By doing so, we are being proactive in trying to prevent its spread. 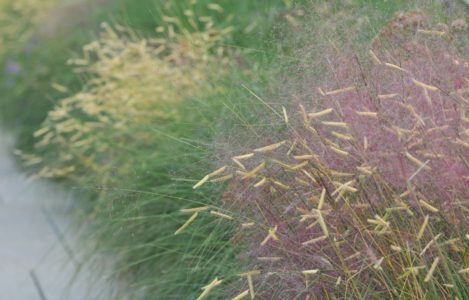 When evaluating Mexican feathergrass, we learned from invasive plant experts that it is not a matter of if but a matter of when Mexican feathergrass becomes widely established – if left unchecked. Mexican feathergrass can survive in USDA hardiness zones 6-10, which means it can survive winters that reach a low of 0° Fahrenheit. Its native range includes Mexico, New Mexico, and Texas, indicating its ability to establish in hot and dry areas of California. Once PlantRight and its committees identify new invasive plants to add, the Plant List Committee begins to determine what regionally appropriate, noninvasive plants to recommend in-lieu of each invasive plant. These are the “suggested alternatives” on the Plant List that would perform the same function in a garden or landscape. We believe in more carrots and less sticks, so you’ll notice several alternatives for every invasive. In 2014 and 2015, we “retired” twelve invasive plants from the list because these plants were rarely found at retail (e.g. an example of how working together in voluntary fashion to phase out invasive plants, works!). In 2016, we “retired” an additional three plants, bringing the number of retirees to 15 invasive plants, out of the 19 on our original list published in 2006. We list these retired invasives on the PlantRight.org website, but no longer feature them on our plant list because they are far less of a threat when they are rarely found at retail. Going forward, PlantRight plans to communicate which invasive plants have met our criteria for addition in October, and to add those new plants following a default 15-month delay. That means that if a new plant is selected for addition in October of 2017, it’s default publication would be January 2019, in order to allow for realistic phase-out timelines. However, those plants that do not require such a long phase-out period will be added to our list as soon as the January immediately following this announcement. PlantRight supports its partner stores and organizations by accepting fair transition periods for phasing out inventories of invasive plants, based on each individual plant’s characteristics. As mentioned above, one of the criteria for placing a species on PlantRight’s list is that it receive a “high risk” rating from the Plant Risk Evaluation (PRE) tool – developed in collaboration with UC Davis, the University of Washington and the CA Center for Urban Horticulture to determine a plant’s potential for becoming invasive in any specific region. The PRE tool was used to scientifically verify the invasive potential of “emerging” plants like Mexican feathergrass, further allowing PlantRight and its committees to make informed decisions in a preventative fashion. The PRE tool is 98% and 95% accurate in predicting a plant’s invasive and noninvasive characteristics, respectively. The tool is currently being refined with the help of garden partners at botanical gardens throughout the country. You can read more about the Plant Risk Evaluator here, and more in-depth information is available in this (March 2015) publication of the peer-reviewed scientific journal PLoS ONE.